This (somewhat) healthy baked eggplant parmesan recipe is my improved version of the Eggplant Parmesan with Spinach recipe from Vegetarian Times. As with most Vegetarian Times recipes, I found the original version to be bland. 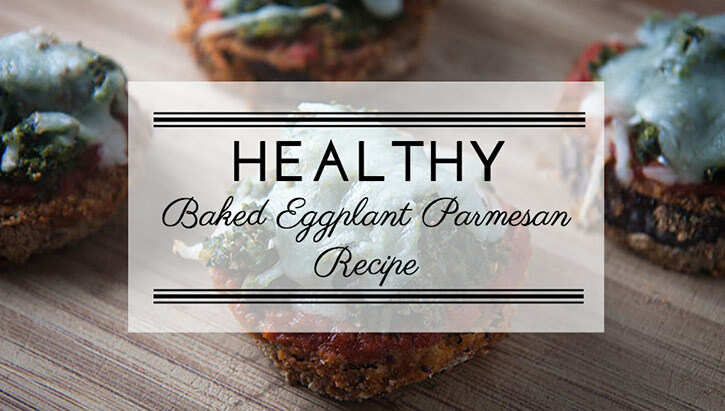 But with a few changes, this healthy baked eggplant parmesan recipe has become a summertime keeper. I say “somewhat healthy” because obviously there are healthier things you could be eating, but as eggplant parm goes, this is about as healthy as it gets. 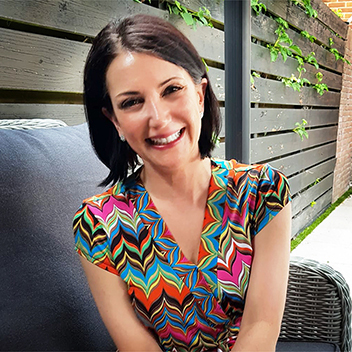 I grew up in Connecticut around some of the best Italian restaurants and delis outside of Italy. A vegetarian since fifteen, I’ve eaten a lot of memorable eggplant parmesan. I still love traditional eggplant parmesan with its heavy layers of fried breaded eggplant and tons of stringy mozzarella. If I ever go back the States, it’s one of the first things I’d want to eat, along with a couple of Taco Bell bean burritos and a Red Robin Whisky River BBQ Gardenburger, fries and campfire sauce. 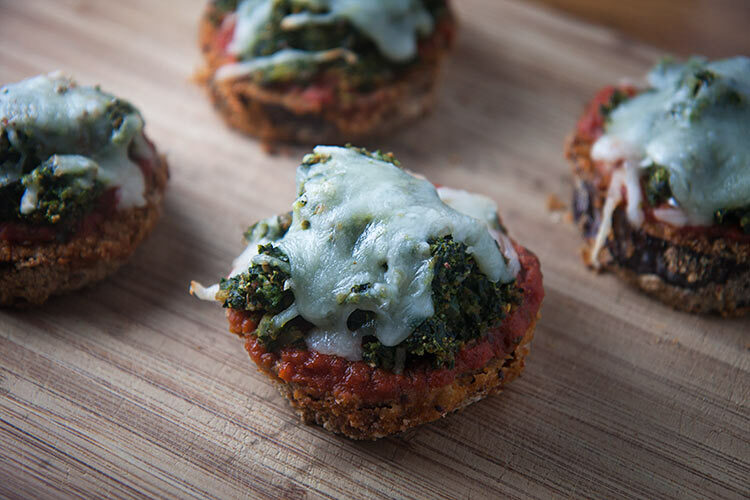 But I don’t generally eat like that, so this lighter, more modern and healthy baked eggplant parmesan recipe with spinach and just enough cheese is much more in line with how I eat everyday. I salt my eggplant and let it sit for at least an hour to draw out excess water, which makes it more tender and less bitter. Their spinach situation is a bit faffy. I use pre-chopped frozen spinach and add it straight to the skillet when preparing the filling, any excess water cooks off quickly and saves me the hassle of a towel-lined sieve and chopping. Who has time for such nonsense? I use herbed cream cheese instead of reduced fat cream cheese. We’re only dealing with one ounce for the entire recipe, so who cares? Panko? Not happening in Denmark. I use homemade whole grain breadcrumbs, which make a light and crispy coating. Why a half cup of Parmesan in the coating? Just add a couple tablespoons to the spinach mixture and use the rest of the calories on that whole fat herbed cream cheese without sacrificing flavor. This recipe is only as good as the sauce you choose. I use homemade pizza sauce, which is full of flavor, not to mention thick, so it stays where I put it. I use fresh mozzarella in place of shredded mozzarella. I use an oil atomizer instead of cooking spray to spray the breaded eggplant before baking. Aerosol-propelled ingredients freak me out. Cut the eggplants into ¾-inch slices, sprinkle them generously with salt, and leave them to sweat for at least an hour, but the longer the better. Rinse and pat them dry. Crack the egg into a shallow dish and beat it. Add the flour to another dish, and 1/3 cup breadcrumbs to a third dish. Dip the eggplant slices in the flour, then the egg, then the breadcrumbs; press the breadcrumbs into the eggplant so they stick. Spray the breaded eggplant on both sides with oil/cooking spray, and arrange them on a greased baking sheet. Bake the eggplant in a preheated 375 degree (190°C) oven for 12 minutes, or until the bottoms are brown and crispy, then flip them over and bake them for another 12 minutes, or until the other side is brown and crispy, too. While the eggplant is baking, heat a skillet over medium-high heat. Add a bit of olive oil, then cook the spinach until all of the excess moisture has evaporated. Stir in the cream cheese, Parmesan, and 1 T breadcrumbs and cook the mixture until it’s heated through and thick. Spread each eggplant slice with a bit of sauce, top with a mound of the spinach mixture and a slice of fresh mozzarella. Put it back in the oven and bake it for 4-5 minutes or until the cheese is melted to perfection. I love the lightness of this recipe, so while pasta is an obvious accompaniment, I never serve it with pasta. It’s really not filling enough on its own, so I recommend a Caesar salad to go with. Or serve it at room temperature with some bruschetta and red wine. Eggplants it’s one of those things where I have always said ewwww but I have never tried it. I am on a mission to try new things this year so this will be on my list. Oh, you should! I’m not a huge fan of eggplant, but eggplant parmesan (especially this one) is delicious! I love eggplant parmesan. It’s great that you changed the recipe to make it a little lighter, but preserve the yummy taste. Baking is always a so much better alternative than frying. Add a light salad and you have one delicious meal. For sure! I’m not a fan of frying at all… I don’t like eating grease, and it’s also a beast to clean up. Fortuantely, it doesn’t get very hot in Denmark, so using the oven even in the middle of summer isn’t an issue. Your changes are absolutely brilliant. Also, I’m going to try that salt trick with eggplant. I’ve never enjoyed it, but that may do just the thing to make it more palatable for me. Thanks, Liz. The salt definitely makes a difference in taste and bitterness. YUM! I plan on making this recipe this summer. We planted eggplants in our garden this year for this very reason. My favorite meal!! So good. Ready for those eggplants to be ready!!! This looks great! My grandmother has always been a fan of eggplant parm and when my daughter sees it now she thinks about her and finally decided to try it for herself. I was surprised when she loved it too, we will have to try to make this soon! This looks amazing! I would love tips on how to best organize a small kitchen, so I look forward to cooking instead of dreading and avoiding it. You are so talented. Thank you for sharing your gifts. This Eggplant Parmesan looks oh so good! Eggplant is something that I don’t cook with near enough. There is no comparison between fresh mozzarella and the shredded stuff! I need to make these for my family! That looks so delicious! I love that this is a healthier version. I can’t eat fried food because of a gall bladder issue, so I am always on the look out for healthier recipes. I can’t wait to try this! The first time I tried the Baked Eggplant Parmesan is when I bought it in frozen isle in BJ’s Club it was good. Lately I’m watching my carbs and this one will really satisfy my cravings. I’m very excited to find this recipe, I’m a vegetarian and my husband loves eggplant. My kitchen skills could use some sprucing up but I think I might be able to handle this recipe. Thank you for sharing! I love eggplant Parmesan and this looks like a great way to save a few calories. Eggplant is very plentiful right now so this is going on my weekly dinner menu. Love your blog and your recipes are delicious! These look super yummy! I love eggplant but it gives me crazy heart burn! =( It’s the worst!! Like really bad!!! But it doesn’t stop me from eating it! =P I am gonna have to try these! YUM. I need to try this recipe. Looks pretty easy to make too! Eggplant parm is my favorite but I never make it on my own. It’s a special treat when we go out for Italian meals.